Conquering the Monkey-bars of life! 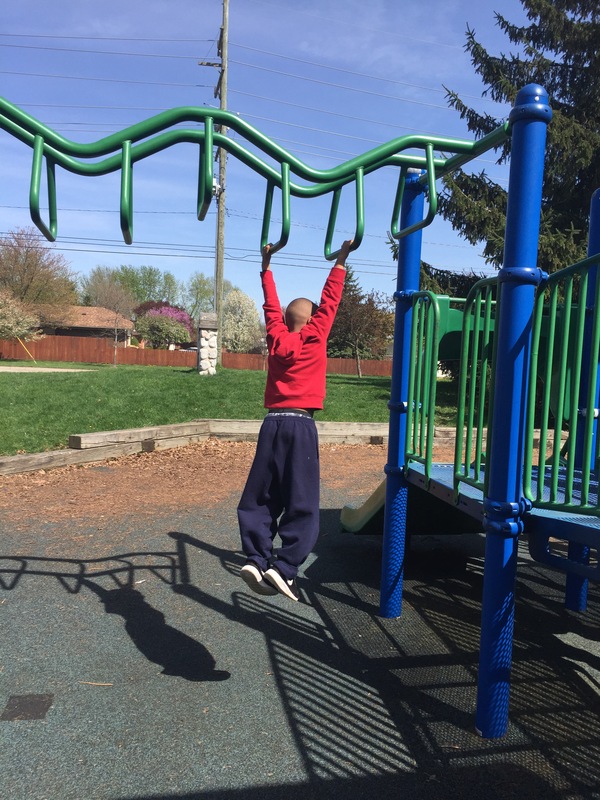 Last year my son could hardly hold onto the monkey bars at the park. He would ask me or daddy to “pick me up and hold me on the bars”. We would do it, and he would grab the bars, hanging and moving forward as we carried him, skipping bars in excitement, until he go to the other side. There were times when he would ask us to let go, and he would hang there, trying to create his own momentum, but eventually he would call us to catch him because his hands were slipping. We would rush and go RUN UNDER him, and walk him to the end of the structure. This was pretty much the entire summer, when he played on the monkey bars. However, yesterday he and his sister asked to go to the park. The weather was finally park worthy, and as soon as they sniffed the sunshine, they are ready to go back to work, which was park visits and playing outside. We arrived at the park, and they burst out the car door in jubilee, right over to the play area. His little sister did her usual, going and making friends, starting conversations with other little kids. He however, ran straight to the monkey bars. I sat down and began to talk to another parent, but I never took my eye off of him. I watched him as he climbed to the top of the platform and then, before I knew it, he was off. At first I waited for him to call me, so I could be ready to RUN UNDER. But, the call never came. I then realized he was going to make it to the other side, all by himself and wouldn’t you know it, he did. Somehow the perceived failures of the past years had grown him, matures him in some way. 1. He was older, wiser and stronger. His muscles were tougher, and could carry the weight of his body across these bars. 2. His mind was different. He didn’t see the monkey bars as he did last year. This year, the fear wasn’t there. He saw them for what they really were, an obstacle he can Conquer. 3. He knew I was there to help him. In fact, I was the first name he called out when he made it to the other side. He knew that if at any point he needed help, I would be there to RUN UNDER. That gave him confidence to focus more on the task of reaching each bar ONE AT A TIME, rather than focusing on falling and rushing to the end of the platform. Essentially, he knew he was ok.
As a result, we now have a professional monkey Bar expert! I was proud of him, but the truth was he did it over and over again, until his hands began to hurt. He came to me and said, “Mom, my hands hurt, I want to keep climbing, but I need your help.” He came to ask me because he knew he could count on me to help. He wanted to keep going, but he acknowledged he was tired and in pain and needed help. Sometimes you will even fall, and hurt yourself, but, Jesus says in Hebrews 2:18, “For in that he himself hath suffered being tempted, he is able to SUCCOUR or RUN UNDER them that are tempted.” and dust us off and put us back on the road. My son learned this lesson yesterday, and by God’s grace, it will carry him to the feet of the cross in the life ahead, because he, you and I are Loved ❤️.